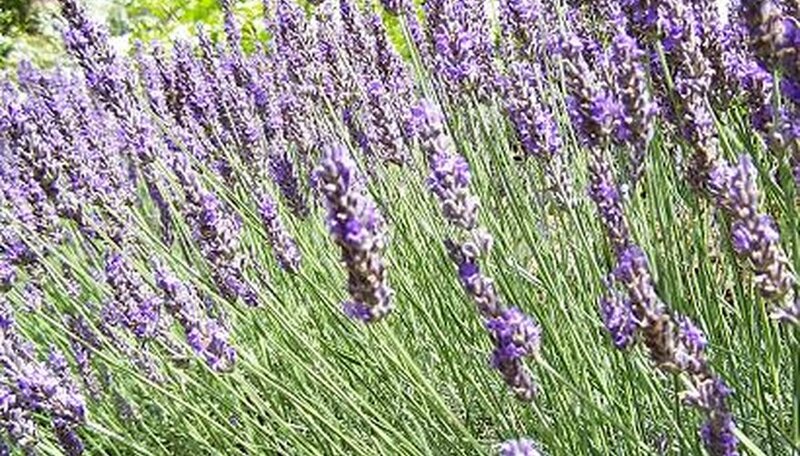 Use steam distillation to extract oil from lavender at home. The steam passes through the herb, picking up tiny droplets of the plant oil. The steam carries the droplets upward, contacting a concave lid, where the oil-laden droplets condense, cool and fall into a collection vessel. The resulting oil is pure essential oil of lavender, which you can blend with carrier oils or ointments. The extracted essential oil-to-water ratio will be approximately 1:25 using this method. Try a practice pot of water to see if your lid works correctly. You can fine-tune the placement of the cup and how much ice to use. Resist the temptation to open the steam chamber (pot) while it is working. The condensation will fall into the pot of water instead of the collection cup. Save the scented water from the cup to use as mister scent to spritz on towels or sheets. Instead of using a piece of brick, you can layer the chopped herb in the bottom of the pot, then place an open-basket vegetable steamer on top of the lavender and the cup in the steamer. Be sure the steamer basket will not tip as the herb softens during steaming. Pure essential oil can be strong and should be diluted in a carrier.